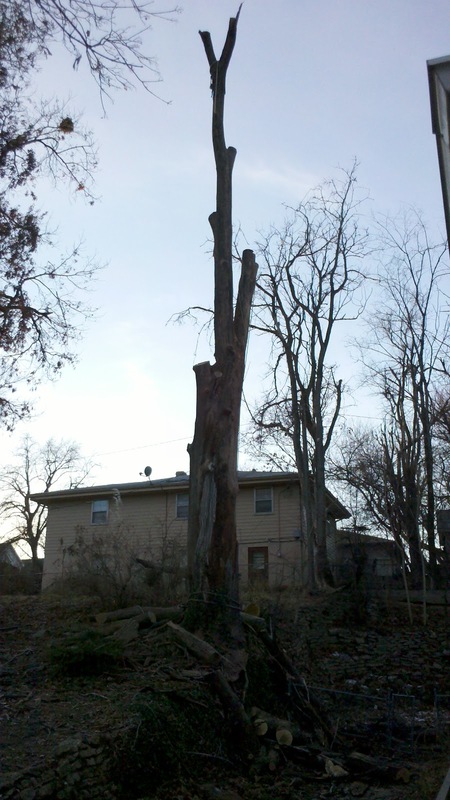 With houses on either side, powerlines, and a fence, every piece of this 75' tree had to be lowered down by rope. Since it was in the back yard, there was no arial lift access. 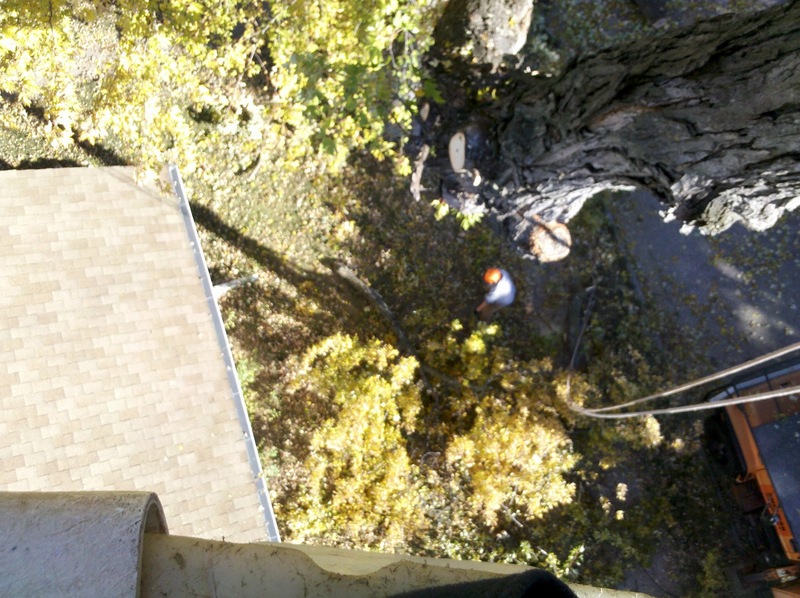 The storms over the weekend have been keeping us busy. Much of the cleanup work has been from Pear Trees. These trees look nice and uniform as they grow, but they are a very soft wood and break easily. Often we will find the whole tree toppled over. 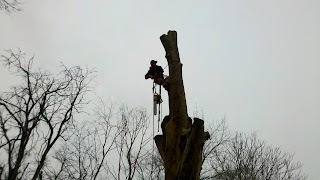 Here are two photos from trees we've worked on. Both are Pear trees. 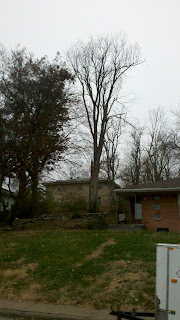 We just tackled this monster of a maple tree. It stood 75' tall and 6.5' across. 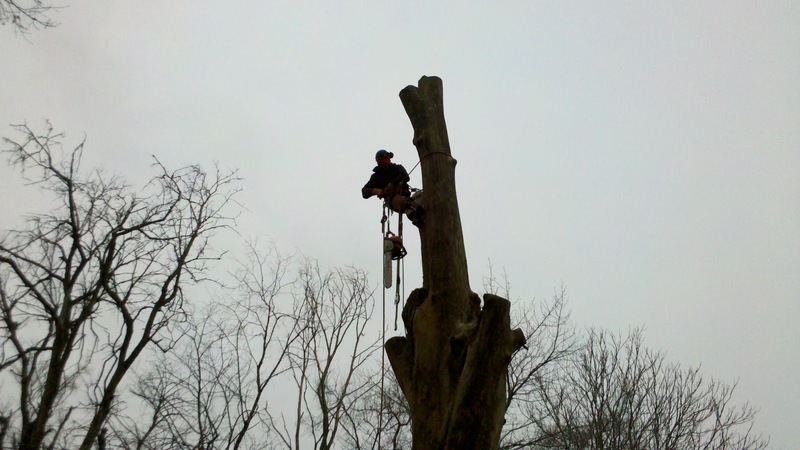 American Arborist just got a new chipper. 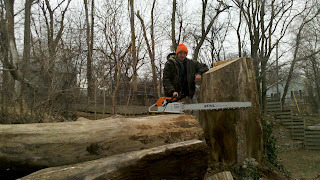 It takes much bigger pieces of wood and processes them much faster than the previous chipper. Watch it work! 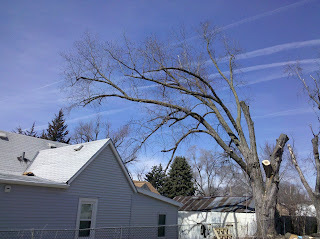 We cut down this 80 foot cottonwood in one day. 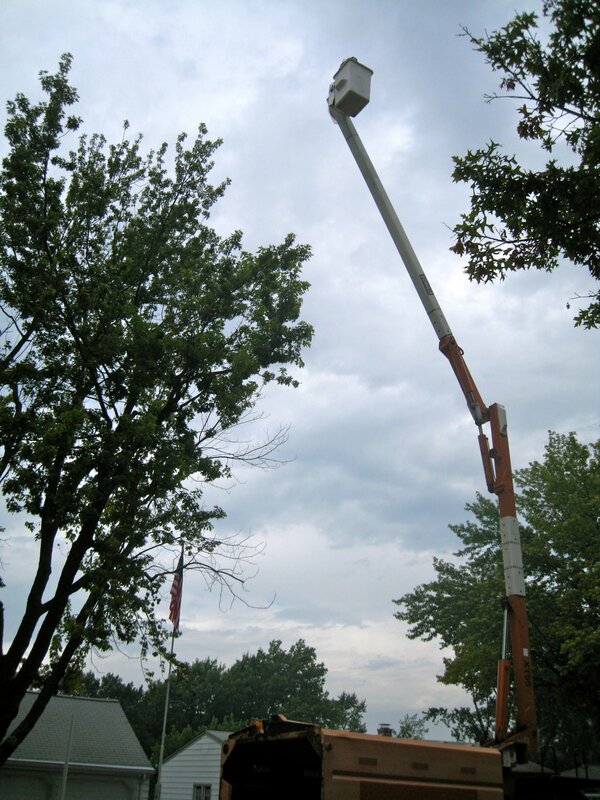 American Arborist now has a 60 foot reach boom truck to make jobs quicker and safer. 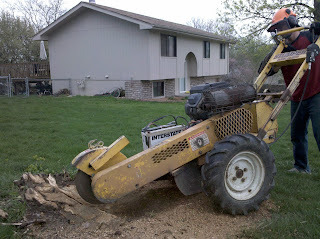 Here it is in use taking out a silver maple tree. It is a very busy time right now for tree timming and removals. This week I have been reminded why the catalpa tree is my favorite tree in Omaha because this tree has been in full bloom. This tree grows giant leaves, it flowers, and almost never has any problems. First National Bank (FNB) joined with the City of Omaha today in a tree planting ceremony to celebrate Arbor Day at North Omaha’s Miller Park. Mayor Jim Suttle presented an Arbor Day proclamation and representatives from the Arbor Day Foundation, Lanoha Nurseries and First National Bank were on hand. The tree planting ceremony marks the end of a six-month “green” initiative in which First National Bank, in partnership with the Arbor Day Foundation, pledged to make a donation to the Arbor Day Foundation to plant a tree for each customer who signed up to receive electronic statements. In total, more than 11,000 new customers signed up for electronic statements, resulting in a donation to the Foundation to plant in forests in need as designated by the Foundation. 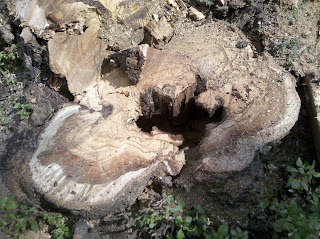 The tree was hollow under the trunk. American Arborist to the rescue! 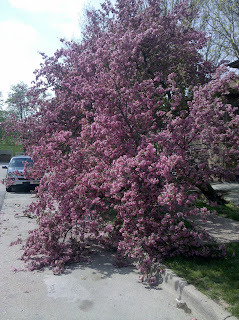 This tree became too heavy for its poor root structure and fell on a car in the street. This tree was riddled with ants, unbeknown to the owner. One cross section of the trunk showed much of it hollowed out by these insects. We just finished a job with 4 large maple trees. 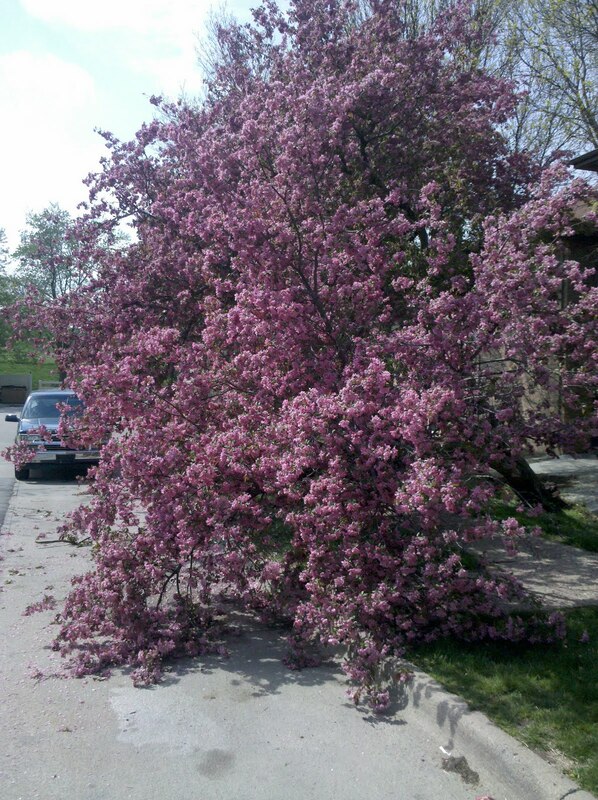 Here is a photo of one of the more difficult trees. 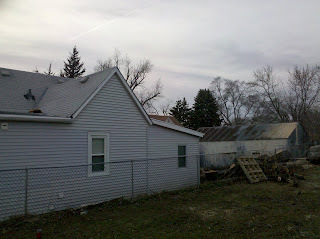 This one was over two sheds, a patio, a fence, and a house. Most of it had to be lowered down piece by piece. The trunk was about 40 inches across. If you are considering topping your tree, don't. It would be better just to remove the tree entirely. 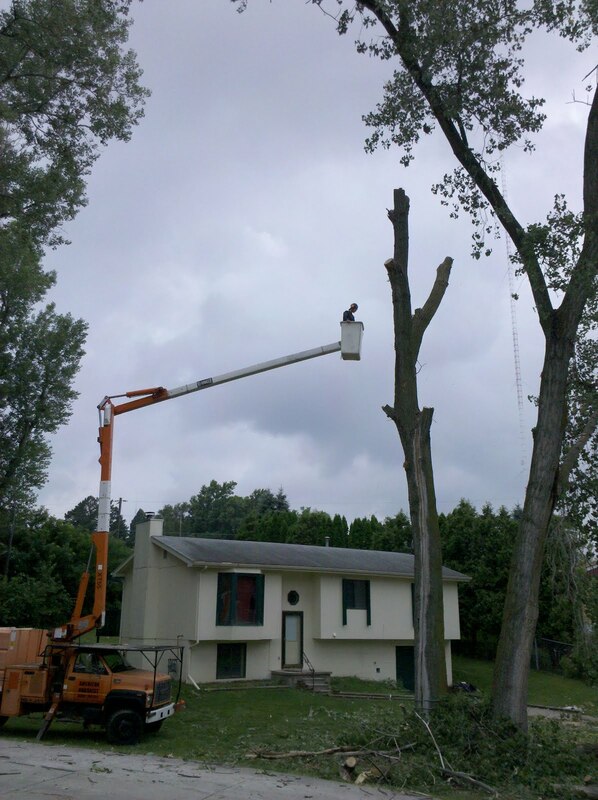 If you are worried about the height of the tree, or certain branches, contact an arborist and get some advice on how to care for the tree. If you haven't gotten my new business card yet, and would like one, please call or write me and I will be sure to get you a few. This business is based largely on referrals, so any referrals you send my way would be greatly appreciated. Thanks again to Daryl Anderson of Clark Creative Group for the help with the logo usage. Spring is a great time to trim your tree. 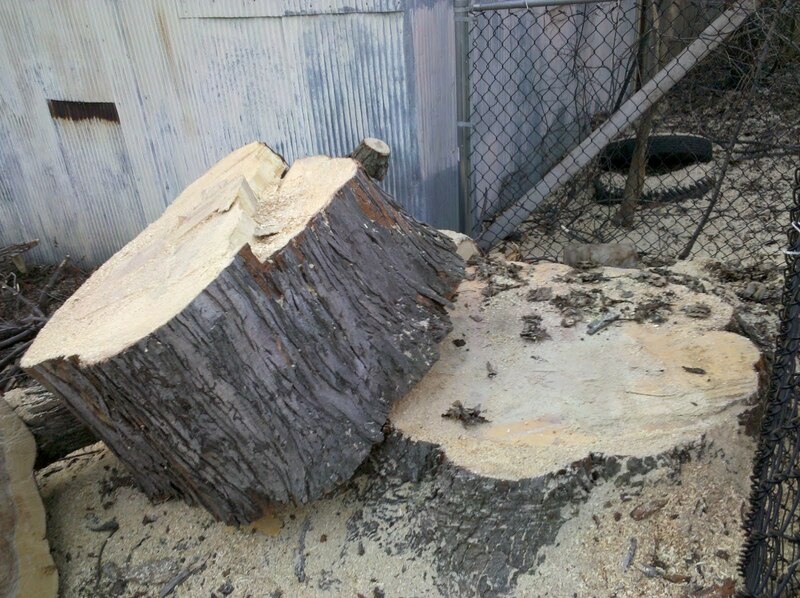 The tree has not dedicated much energy into growing leaves yet and cuts are less likely to get infection. 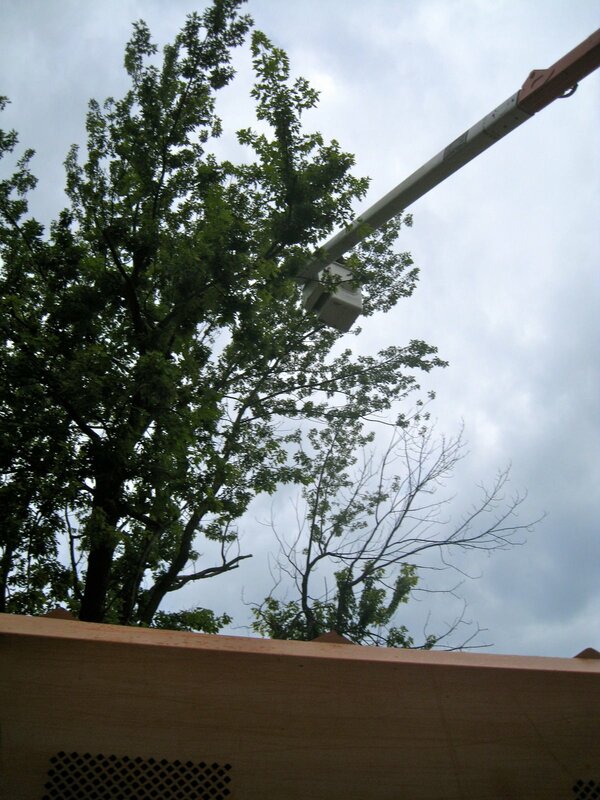 If you notice that your tree has some damage from winter, give me a call for a free estimate and consultation. Now is the best time to trim your bushes and shrubs. Spring trimming will allow the bush to fill in correctly, especially if you are performing some drastic reduction. 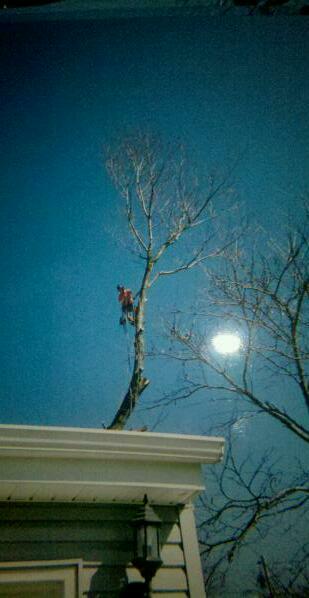 Call me for any estimates or questions about your tree or shrub needs. Residents of Carroll, Harlan, and other cities in Iowa were hit last month with several ice storms. Most of the trees in the towns were affected by the ice. The above picture is from Carroll, IA. 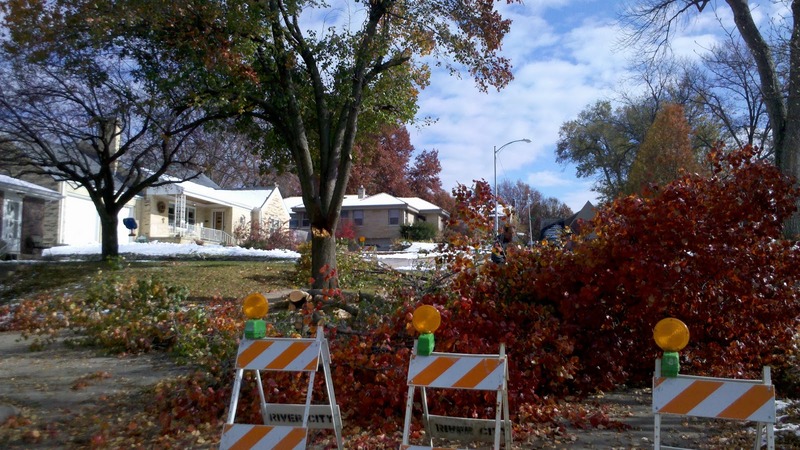 American Arborist is now offering services in Iowa to help the cities recover from the storm. Lots of different materials qualify as mulch, from rocks to recycled rubber, but the most effective mulch in the urban landscape is arborist wood chips. Why? Coarse woody debris, or wood chips, break down slowly and release their stored energy back into the ground for use by other plants. Interestingly, their slow release rate is less likely to overstimulate plants in the way that a commercial fertilizer or compost would do. 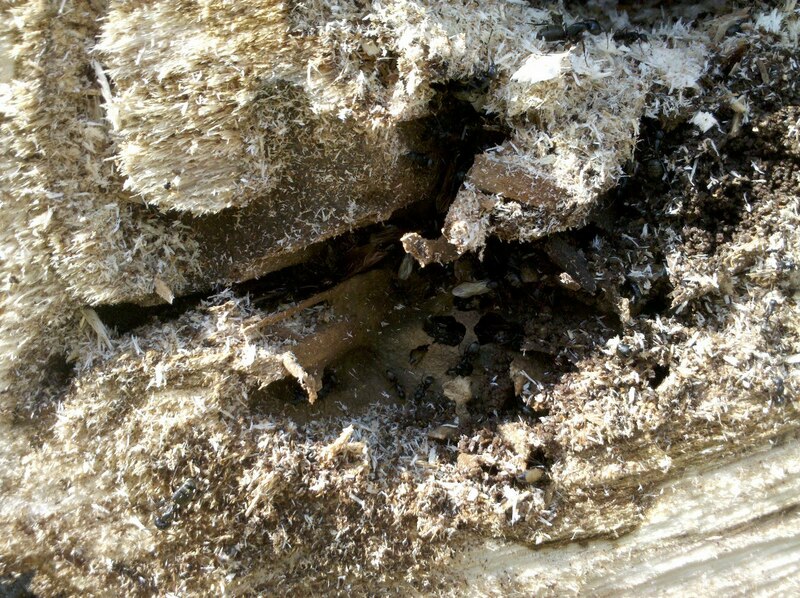 Wood chips also require a fungal relationship to break down. This fungal symbiosis then reacts with roots of plants in a form called mychorizae (see image above), which is neither root or fungus, but a whole new organism benefiting both. Fungal growth also inhabits the niche that weeds like to grow in. In other words, more fungal activity in soils equals less weeds! Mulch as wide an area as possible. 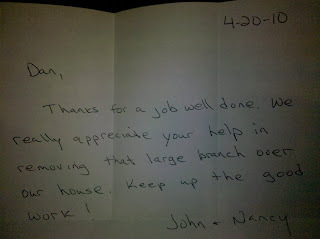 The best mulches are full of organic coarse debris, like arborist wood chips. Get rid of turf and weeds by sheet mulching. Mulch thick -4 inches deep - to inhibit weed growth. 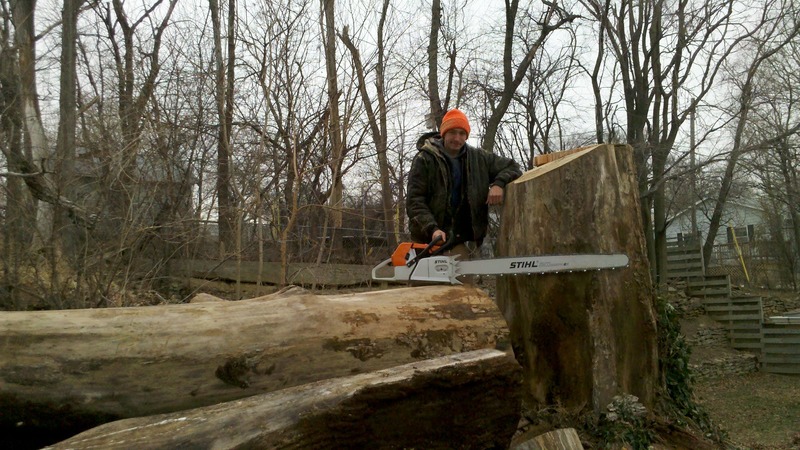 That's about it - if you need wood chips in the Omaha area please contact us, American Arborist would be happy to provide them for you. 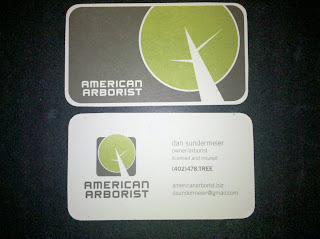 American Arborist is actively seeking help for the 2010 season. Any interested persons should apply to dsundermeier@gmail.com. Submit your resume, references, and skill sets. 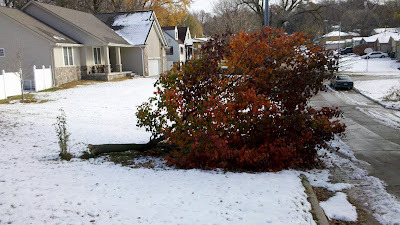 Did your trees get damaged by the ice and snow this winter? 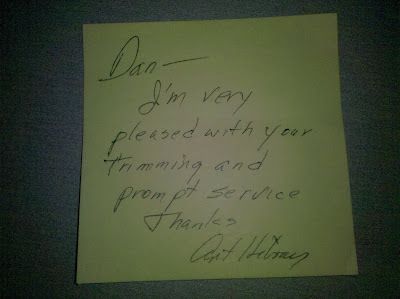 Contact us for consultation and FREE estimates. 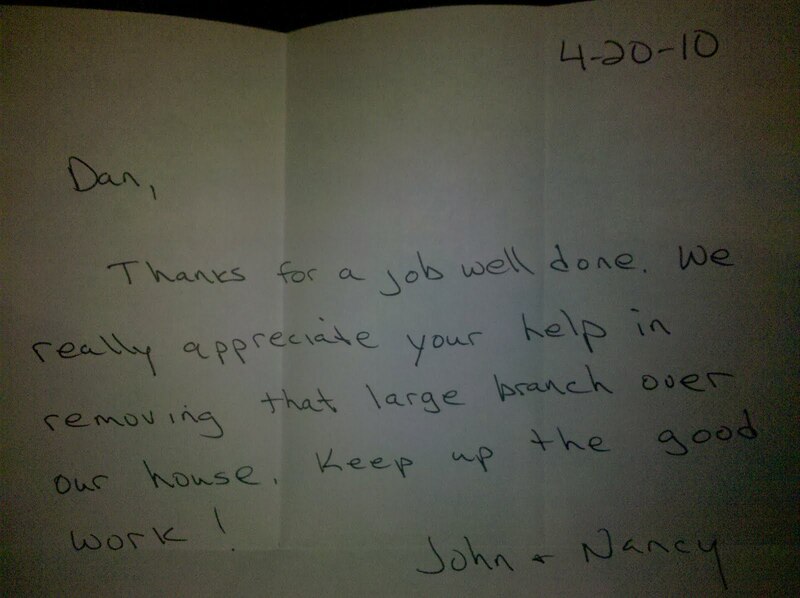 Don't wait until the snow melts to contact us! We are lining up our jobs in preparation for the nice weather.